The Xbox 360 console supports different cable types. Learn how to connect your console to a high-definition or standard-definition TV or monitor using different cables. Important note This article applies to the original Xbox 360 and Xbox 360 S consoles only. 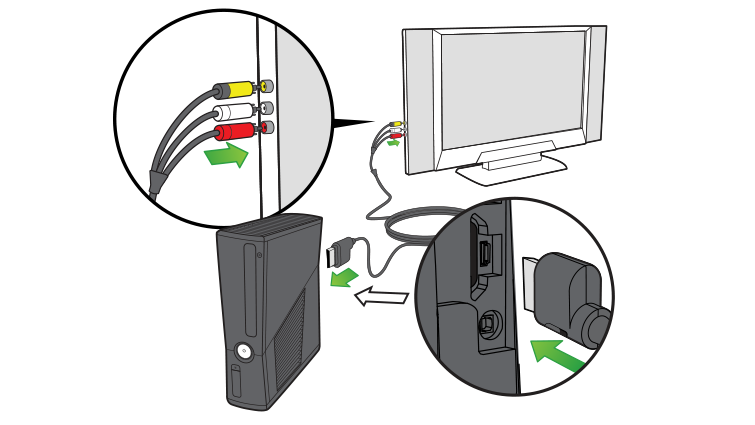 For information about connecting the Xbox 360 E console to a TV, see How to connect your Xbox 360 E to a TV. Which cable do you have? The HDMI (High-Definition Multimedia Interface) cable is the most common cable to use with HDTV and high-definition monitors. Not all original Xbox 360 consoles have an HDMI port. If you don’t see the Xbox Dashboard when you turn on your TV and console, you might need to select the video input. The Xbox 360 Component HD AV Cable comes with some Xbox 360 console bundles. It works with both high-definition and standard TVs and monitors. High definition: Set to HDTV. Note Set the switch to HDTV only if your TV or monitor supports a screen resolution of 480p or higher. Connect the connectors on the component HD A/V cable to the corresponding color input jacks on the TV. On a high-definition TV, if the cable has a yellow RCA composite video connector, leave it disconnected. Note To connect to a standard TV, use only the yellow, red, and white connectors. Do not use the other connectors. Connect the A/V connector on the component HD A/V cable to the A/V port on the console. The Xbox 360 VGA HD AV Cable is not usually included in Xbox 360 console bundles. If your display requires this cable, you need to purchase it separately. If you already have the cable but your display does not have a VGA port, you can purchase an adapter. Connect the A/V connector on the VGA cable to the A/V port on the console. Connect the VGA connector on the VGA cable to the VGA port on your HDTV or monitor. Connect the left and right (white and red) audio connectors on the VGA cable to the audio port on the monitor. Use the Xbox 360 Composite AV Cable with a standard-definition TV or monitor. This cable does not support high-definition displays. Plug the A/V connectors into the corresponding color-coded ports on the SCART adapter. Plug the A/V cable and the SCART adapter into an available SCART connection port. Turn on the TV or console. Would you like to contact Support regarding the "How to connect your Xbox 360 S or original Xbox 360 to a TV" issue you were reading about or a different issue?